A recent article in the news explored how dogs communicate with their humans – and gave an opinion on which species is smarter (dogs versus cats). First Up – Who’s Smarter? 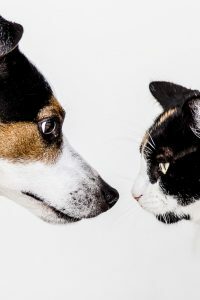 While dog owners like to think their favoured pet is smart for his loyalty, friendliness, and willingness to be trained, it’s for the very opposite traits that cat owners believe their feline friends are smart – aloofness, attitude, and independence. But science has an answer of sorts. Dogs have an anatomically and physiologically denser cerebral cortex in the brain, with more than twice as many neurons determining their behaviour than do cats. These are the “little grey cells” that do the thinking and govern complex behaviour and planning. Scientists believe this indicates a richer mental state and higher intelligence. Dogs have many more cortical neurons than any other carnivore – yet the previous theory that carnivores have higher brain capacity than their prey has been all but been debunked, with the ratio of brain size to neuron number being the same in herbivores. Neuron number and brain size are not relative, and brown bears, for example, have a similar number as cats although his brain is ten times larger. (Fun Fact: a racoon has as many neurons as a primate). So based on the physiology of their brains, dogs are smarter than cats! Your dog communicates with so much more than his voice (i.e. barking, whining, and growling). A study undertaken by the University of Salford, Manchester, looked into how canines communicate with humans, and found, as reported in the scientific journal Animal Cognition, that dogs use up to forty-seven different body gestures to communicate. Only nineteen of these have been accurately translated to date. Interestingly, most communications from your dog don’t relate to food, but to being physically touched. The best way to understand your dog’s communication is to pay attention and get to know him. The same goes for your pet cat – when you are in tune with them, you can understand what they want – and they can certainly understand you too!